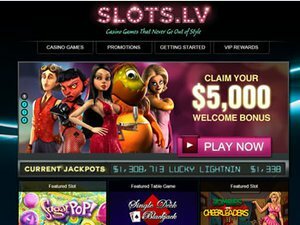 If you could double the size of your deposits, you could double your chances of winning, and that's exactly what Slots.lv is giving you for a limited time. Does an extra $700 each week sound like a good idea to you? It sure does to us, and that's why we're so excited about the new promotion happening at Slots.lv. The way this promotion works is that you can get a 100 percent match bonus on your deposits up to seven times each week during the promotional period with a $100 maximum on each deposit. This is a total of up to $700 free each week, and that's worth getting excited about. But that's not all. If you're a new player, then you can get a $22 no deposit offer just for signing up. This no deposit deal will give you an opportunity to win real money prizes on your favorite games without having to wager anything of your own. This type of risk-free bet is called a freeroll, and that means you have a chance to win something real without losing anything at all other than the time it takes to play. At Slots.lv, the name says it all, and you'll have an opportunity to enjoy a ton of online slots when you play here. Get in on the action with this set of promotions and get awesome values for your bankroll while you take your shot at big winnings in some of the hottest games running today.